Good People, Great Values…for Life! First Team is changing the way car-buying is done! 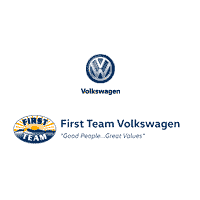 When you buy a car from First Team, you can receive these services for life. That’s what Good People, Great Values is all about. ALL Your Scheduled Oil & Filter Changes Covered for LIFE! Your Engine Covered for LIFE! Your State Inspections Covered for LIFE! Your Multipoint Courtesy Inspections -Covered for LIFE! Your Parts and Service Guaranteed for LIFE! Your Exterior Car Washes Covered for LIFE! Receive an additional $500 OFF our Website “Sale Price”; If you’re an employee or retiree of a VWoA business partner or an immediate family member who resides in the same household! Please visit our Partner Program Page, or contact either your HR Department or the Sales Department for further Qualifications. NOT APPLICABLE towards the VW Golf R, or New ’15/’16 TDI vehicles. Visit the VW Partner Program page to check eligibility! Receive a minimum of $500 OFF and financing; if you are graduating within the next six months or have graduated within the past 24 months! Please visit our College Grad Page, and contact the Sales Department for further Qualifications. While the program applies to all Used & New ’17, & ’18 Model Years, the $500 Bonus is ONLY APPLICABLE towards New Vehicles. NOT APPLICABLE towards the VW Golf R.
Receive an additional $500 OFF our Website “Sale Price”; if you are an Active Duty, Veteran, or a Retiree of the US Military, OR a Police Officer, Sheriff/Sheriff’s Deputy, Correctional Officer, State Trooper, Federal Law Enforcement Officer, Firefighter, EMT, or a Paramedics. Please visit our Military & First Responders Page or contact the Sales Department for further Qualifications. NOT APPLICABLE towards the Golf R! MSRP and our Internet Market Value Price (iMVP) shown excludes tax, title, license, freight (Jetta, Passat, Golf, Golf Alltrack, Golf Sportwagen, Golf GTI, Beetle: $895, Tiguan: $995, Atlas: $995) and $697 Processing Fee (Out of State Processing Fee is $875). iMVP includes available factory incentives/cash and First Team discount. Prices may include VCI finance and/or other factory incentives that require financing through Volkswagen Credit, inc. Conditional offers such as Military and College Grad are not included in our price and are available to those who qualify. All offers are with approved credit, and most offers cannot be combined with other offers. Low APR financing may be in lieu of sale price or other incentives. Prices and availability subject to change without notice. Images for illustrative purposes only and may not reflect exact vehicle color, trim, etc. Mileage estimates reflect new EPA methods beginning with 2008 models. Your actual mileage will vary with options, driving conditions, driving habits and vehicle’s condition. Mileage estimates may be derived from previous year model. First Team takes great care to post accurate information however we are not responsible for any errors or omissions so please ask sales person to verify all information before relying on its accuracy. PLEASE CALL TO CONFIRM VEHICLE AVAILABILITY AND LOCATION PRIOR TO YOUR VISIT TO THE DEALERSHIP. We appreciate your interest in our inventory, and apologize we do not have model details displaying on the website at this time. Please fill the form out below and our team will quickly respond, or, please call us at 540-366-4830 for more information. First Team Volkswagen	37.346830, -79.957530.